Living a Fit and Full Life: Keep All Your Devices Charged with myCharge's HubMax Rechargeable 10050mAh Portable Charger! Keep All Your Devices Charged with myCharge's HubMax Rechargeable 10050mAh Portable Charger! The new myCharge HubMax 10050mAh portable charger is the packed with power. With an integrated Apple® Lightning™ cable, an integrated micro-USB cable and a built-in USB port you can easily stay charged anywhere. Carrying USB cables is a thing of the past, not only are the cables built in for effortless charging but self-contained wall prongs make for effortless recharging. Boasting a 30% reduction in size, the HubMax is more compact and portable than ever before. 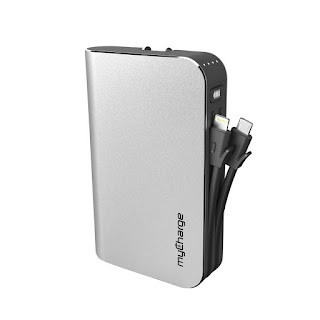 Keep all your devices charged with myCharge's HubMax Rechargeable 10050mAh Portable Charger! 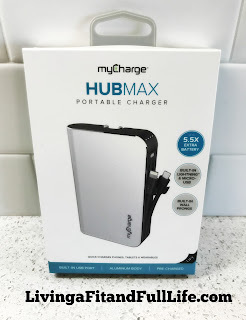 With myself, my husband and my 4 kiddos we tend to use a lot of chargers but myCharge's HubMax Rechargeable 10050mAh Portable Charger is by far my favorite! I absolutely love that it can plug directly into the wall with it's self contained wall prongs and has all the cables built in. It's a perfectionists dream come true. No longer do I have cables and electrical cords all over my counter all day everyday. With myCharge's HubMax Rechargeable 10050mAh Portable Charger there's no clutter. Everything is self contained and I can simply plug in my devices and they're charged in record time. I also love how light and portable the myCharge HubMax Rechargeable 10050mAh Portable Charger is and often carry it around in my diaper bag while running errands. myCharge's HubMax Rechargeable 10050mAh Portable Charger is the perfect charger and I highly recommend it!